It is a delicacy, a pure joy to the palate that has a such rich history: this delicious creation is called turrón or, in other words, Spanish nougat. 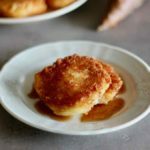 It is the result of a clever blend of honey, sugar, egg white, and almonds or hazelnuts. Simple and natural ingredients, abundantly available in the Mediterranean basin. Turrón, turrón in Spanish, or torró in Catalan, is the most popular Christmas confectionery in Spain and Catalonia. What is the origin of the word turrón? Some etymological sources link the word turrón to the Catalan word torrar, from the Latin torrere, which means “roasting”; or the word terra, where terró means “clod of earth”, certainly a reference to the color and the texture of one of the varieties of turrón, the soft turrón. Nougat is a confectionery typical of the countries of the Mediterranean basin. It can be white, with beaten egg whites, or black, without egg whites. It contains honey and/or sugar, nuts and/or dried fruits, whole, broken or ground and some recipes even add a flavor. The nougat is usually placed between two thin wafers (often made of potato starch). 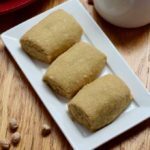 What are the different types of nougats around the world? Its name, shape and method of preparation are different from one country to another. In Spain, it is called turrón de Jijona, de Alicante, or de Agramunt. In Italy, it has several names: torrone, copeta, mandorlato or cubbaita. In Morocco, it is called jabane, in Malta, qubbajt, in Turkey, koz helva, in Greece, mandolato, in Germany türkischer Honig (Turkish honey), and in Iran, gaz. In France, you can enjoy the famous nougat de Montélimar or nougat de Provence, which is also called the Catalan touron. What is the origin of nougat? The first traces of white nougat are found around the tenth century in an Arab book from Baghdad. At the time, it is called nātif. 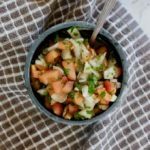 One of these recipes indicates that the nātif is from Harran, a city located between Urfa in the south of present-day Turkey and Aleppo in Syria, which in the 10th century was a commercial and intellectual city. We find the nātif between Urfa, Aleppo and Baghdad: at the end of the tenth century, the traveler and geographer Mohammed Abul-Kassem ibn Hawqal mentioned that he ate nātif in Manbij, Syria, as well as in Bukhara, Uzbekistan. By consulting some cookbooks written between the tenth and sixteenth century, you can follow the migration of nougat under different names (in the eleventh century in Baghdad, thirteenth century in Aleppo and al-Andalus, fourteenth century in Cairo and Catalonia). The turrón is a legacy of Andalusian nougats called ma’qud or qubbayt. Qubbayt is at the origin of Italian nougats called cubbaita or copeta. As for the Italian torrone, it is based on Catalan turrón: southern Italy belonged to the kingdom of Aragon-Catalonia for several centuries. During the 10th century, references to nougat are also found throughout the Maghreb. In France, the nougat first appeared under the name of nogat. The word nogat, meaning “nut” in Occitan, appeared in 1595 in a pharmacy book and in 1607 in a book of dietetics, “Le Thresor de santé” or “mesnage de la vie humaine”, both published in Lyon. It is present in Provence and Languedoc and is called nogat until the beginning of the eleventh century. The nougat of Provence, like the nougat of Montélimar therefore take their origin from Arab nougat, Catalan nougat and Italian nougat. The nougat of Montelimar has been recognized since 1701. 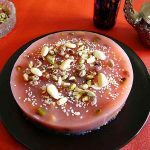 The tradition of 13 Christmas desserts in Provence has been recognized since the 17th century and nougat was already present there before the French Revolution. In Catalonia, in the fifteenth century, when the nogat has already been mentioned, there is a black nougat recipe with pinyonat pine nuts. A confectionery called pinhonat, close to the Catalan pinyonat is marketed in Montauban in the fourteenth century. In 1555, Nostradamus offers, in his book of jams, a recipe of white nougat with almonds called pignolat. This recipe, taken by Olivier de Serres and Lancelot de Casteau, is announced by Nostradamus as originating from Italy. Today, there are hundreds of variations of nougat around the world: some inspired directly from the original recipe, others that only bear the name nougat but are quite far from the traditional recipe. For example, the popular nougat from Tours, a 19th century specialty made of shortbread pastry topped with a marmalade of apricots and candied fruit. The two main varieties of Spanish turrón are: the turrón de Jijona, which is the soft nougat, and the turrón de Alicante which is the hard nougat. 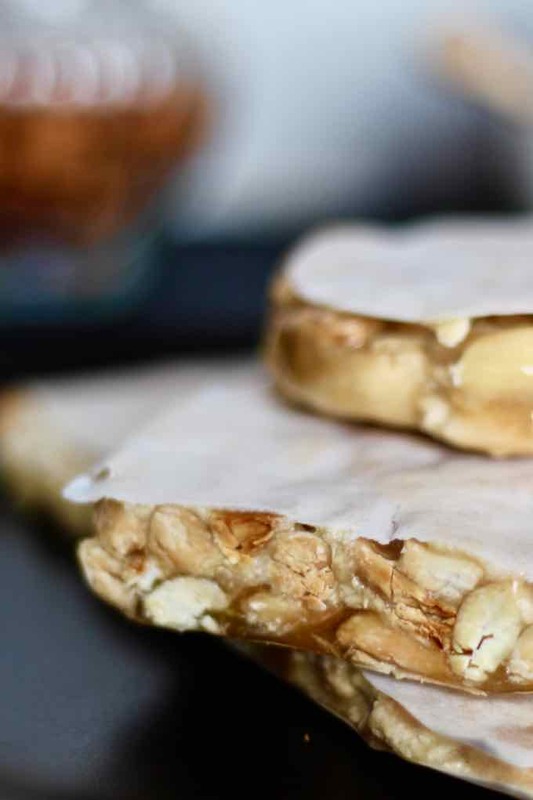 – The turrón of Alicante is composed of a preparation made from honey, sugar, egg white and roasted whole blanched almonds, traditionally wrapped between two paper wafers. 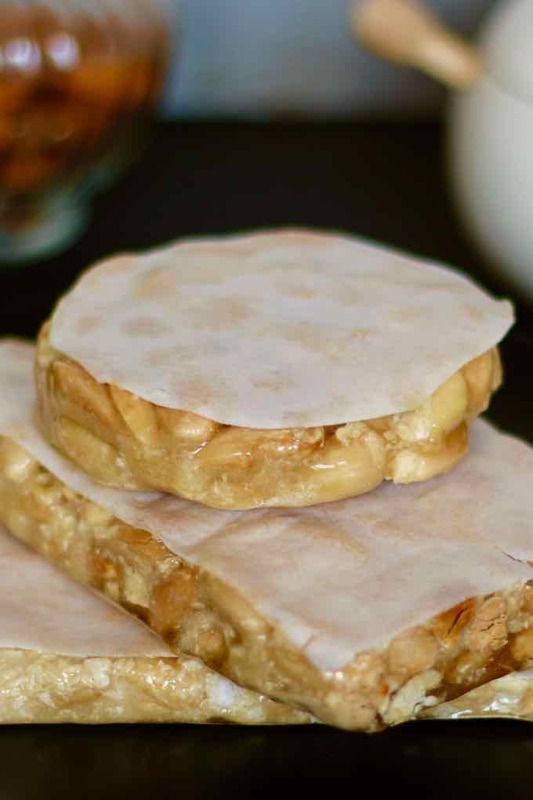 – The turrón of Jijona is composed of a ground preparation, made of honey, sugar, egg white and roasted almonds. 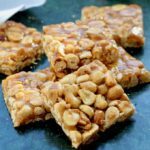 – The turrón de Agramunt, made with a mixture of honey, sugar, egg white and whole hazelnuts. It can sometimes contain almonds. 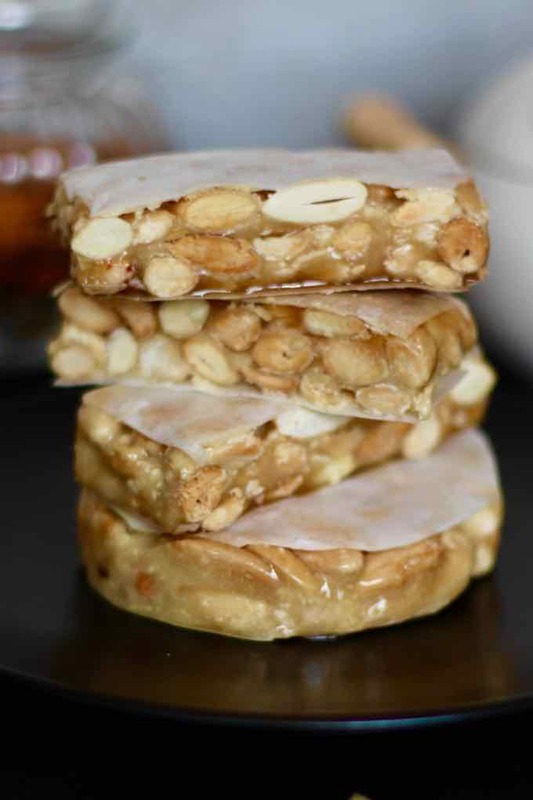 – The turrón de Cherta, made of hazelnuts or almonds, honey, sugar and egg white. It always has a circular shape. – The turrón de trufa, prepared with chocolate and other ingredients. It is presented in bars. 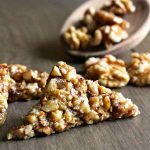 – The turrón de chocolate with many varieties of chocolates such as chocolate with puffed rice, chocolate with nuts, hazelnuts or almonds, or even chocolate with cherries. – The turrón de yema tostada (with egg yolks), typically Catalan, created originally to use the egg yolks when the egg whites were used for hard and soft nougats. This turrón was inspired by Catalan cream. – The turrón de coco which contains a large quantity of dried coconut. Besides the two most famous varieties of turrón mentioned above, turrón de coco is one of the oldest versions of turrón. 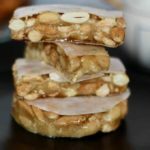 I chose to prepare the hard nougat, almond-based turrón de Alicante in memory of my grandfather Yaacov during the Jewish holiday of Sukkot. In Morocco, and especially in the imperial city where I was born, Fez, we had the tradition of making nougat in large quantities during this holiday. During that time, my grandfather used to make pounds of almond nougat which he generously distributed to the entire Jewish community. In the Jewish community, we did not call it jabane, but dréa del noix (nut cake), nut meaning almond. At the time, we did not wrap it between two wafer papers but rather between two sheets of parchment paper; and it was a challenging game to extract this sticky nougat without leaving any trace of paper on it! A sweet memory of my childhood! “Christmas without turrón is a party for nobody”, the Catalans say! They are surely right but if you want my advice: do not wait until Christmas to prepare this delicious turrón! It is a real treat! Turrón or Spanish nougat, is the delicious result of a clever traditional mix of honey, sugar, egg white, and almonds or hazelnuts. Roast the almonds for a few minutes, stirring from time to time with a wooden spoon and making sure they do not burn. Pour the sugar into a saucepan. Add the water and prepare a syrup. Bring to 250 F slowly over low heat until you get a caramel consistency. In another saucepan, melt the honey. Add hot honey to sugar syrup and stir. Beat the egg white until stiff and mix gently with the syrup. Place a wafer paper at the bottom of a rectangular bottomless metal pan (about 8x6 inches). Pour the turrón mixture to obtain a thickness of about ½ inch. Place a second wafer paper on top, pressing it firmly with the palm of your hand to secure it. Place the turrón in the refrigerator until it hardens. To serve, cut small squares or rectangles. The almonds should be hot when added to the nougat. Otherwise it would create a thermal shock and the turrón would harden instantly.